She's only sixteen, yet she owns Dane's Invocation Stone and crosses the battlefield like a goddess. Many men would give their lives to protect her. His eyes are marked by a loss of innocence; such a young woman who must look straight for all this devastation. 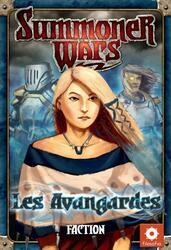 She is Sera Eldwyn, protected, general and Grand Master of Avangardes. Be careful this game is an extension of Summoner Wars: Master Set and cannot be played alone. To be able to play it you must have a copy of the game Summoner Wars: Master Set .